A 'fully cooked' ham can be sliced and eaten cold in sandwiches and salads, but the flavor and texture are greatly improved by heating. 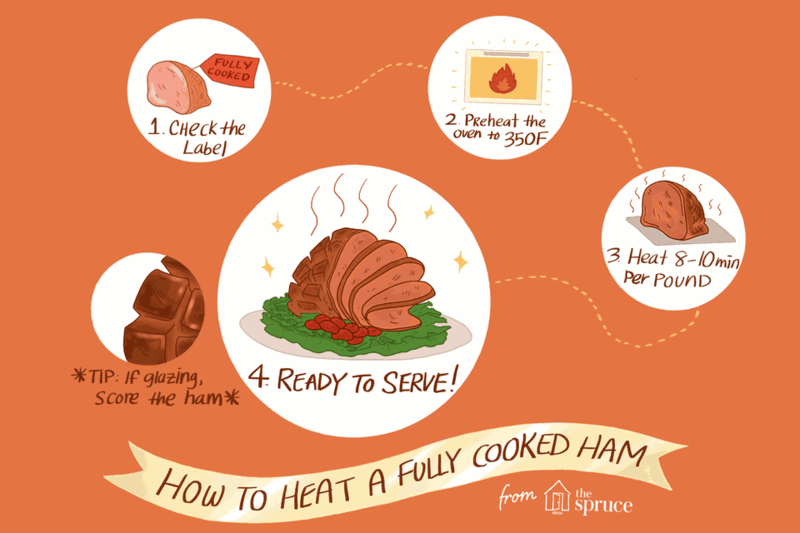 Here's how to heat a ham labeled "fully cooked." These instructions apply to hams which are packaged in USDA inspected plants. Hams which are not from USDA inspected plants are heated to 165 F.
Place the ham on a rack in a large baking pan and add about 1/4-inch to 1/2-inch of water to the pan. If the ham is labeled 'fully cooked' (does not require heating), heat it in the oven for about 10 minutes per pound, or to an internal temperature of 140 F.
To heat a spiral-sliced ham, place it on a sheet of heavy-duty foil, cut-side down. Wrap the ham tightly with the foil and bake at 300 F for about 15 minutes per pound, or until a meat thermometer registers 140 F when inserted into the thickest part of the meat, not touching bone. If the ham is labeled 'cook before eating,' heat in an oven set no lower than 325 F to an internal temperature of at least 145 F.
If you have a large enough slow cooker, put the ham in it and add about 1 cup of ginger ale, cola, stock, or water. Heat the ham on low for approximately 8 to 10 hours, or until the temperature reaches 140 F for a 'fully cooked' ham or 145 F for a 'cook before eating' ham. Leftover cooked ham -- as with other leftovers -- must be reheated to a temperature of at least 165 F. This temperature also applies to hams which come from places not USDA inspected. If you are glazing the ham, you might want to score it. This makes for an attractive presentation, and it will allow the glaze to penetrate the meat. With a sharp knife, score the surface of the ham in a diamond pattern. For extra flavor, if desired, insert a whole clove into each cut intersection or in the centers of the diamonds. Score the ham before baking. About 30 minutes before the ham is done, arrange pineapple slices over the ham and secure them with toothpicks or whole cloves. Place a maraschino cherry in the center of each pineapple slice, if desired; secure them with toothpicks or cloves. A glaze may be applied after the ham is cooked. Increase the oven temperature from about 350 F to 400 F and brush the glaze over the meat. Bake the ham just until the glaze is golden brown. A small ham or ham slice can be glazed and then browned quickly under the broiler. The sweet glaze can burn easily, so check it frequently. The picnic ham (or smoked shoulder) is smoked like a ham but it comes from the shoulder of the animal. It tastes like ham but is not real ham (a true ham comes from the hind leg of the animal). It is fattier than a ham, requires longer cooking, and has more bones.